Sustainable development requires strong IT support. Carbonstop, with years of exploration and accumulation in the sustainable field, has established an IT team with strong technical skills and a deep understanding of the sustainable field, providing comprehensive IT support to partners in the sustainable field. Up to now, Carbonstop has cooperated with UNEP, SEE Foundation, NRDC, IPE, CDP, CCP, Beijing Environment Exchange, China Environmental Protection Association and Shanghai Carbon Assets and so on, we successfully developed IT products related to sustainability. The development includes: platform development, system development, website development, WeChat APP, and mini programe development. The online database of pollution sources established by IPE currently includes more than 120,000 polluting companies' regulatory records. These records cover environmental media such as water, gas and solid waste. 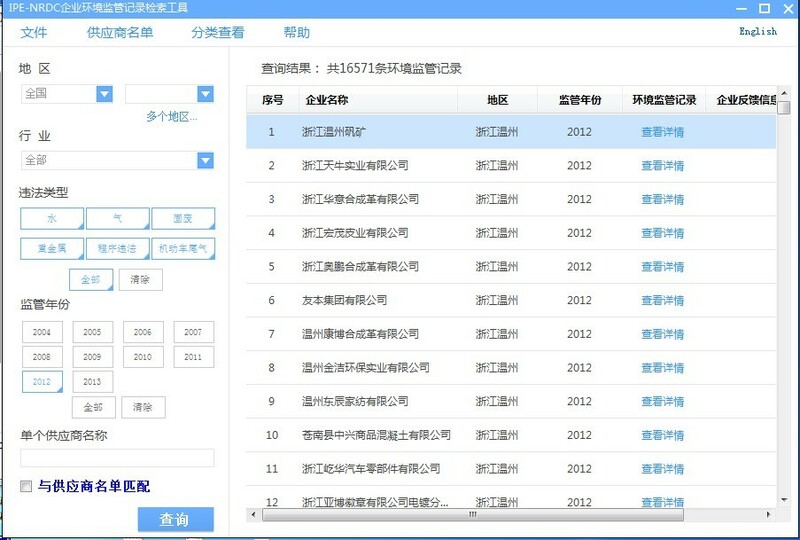 As international apparel brands and retailers will strengthen their supplier management needs, the Institute of Public & Environment Affairs (IPE) and the National Natural Resources Defense Council (NRDC) have led the development of supplier environmental violation search engines to help international brands Understand the environmental performance of suppliers in China to promote the implementation of responsible procurement plans. The development of this software was accomplished by carbon traces.